When our Lord refers to himself as “this Temple”, note that it is not “this body”. The Temple is one in which the Lord dwells, so Jesus said, “this Temple”. Jesus is the Temple and in three days He raised it up.” 1 Cor. 5: 1: For we know that if the tent that is our earthly home is destroyed, we have a building from God, a house not made with hands, eternal in the heavens. that is, eternal, durable, forever (Mark 14: 58). When Jesus was on trial for His crucifixion, one of the accusations was quite alike to today’s Gospel, We heard him say, ‘I will destroy this temple that is made with hands, and in three days I will build another, not made with hands.’” (Mark 14: 58). Again in the night of betrayal, when the disciples did not understand Jesus’ pronouncement He was leaving, Jesus answered him, “If anyone loves me, he will keep my word, and my Father will love him, and we will come to him and make our home with him. John 14:23 And again that same night in response to the same apostolic fear, the Lord said to them, and us: “In my Father’s house are many rooms. If it were not so, would I have told you that I go to prepare a place for you? John 14:2 . The Apostle Peter wrote to the congregations of the diaspora, “you yourselves like living stones are being built up as a spiritual house, to be a holy priesthood, to offer spiritual sacrifices acceptable to God through Jesus Christ.”(1 Peter 2: 5). The apostle Paul wrote to the Corinthians: “Now you are the body of Christ and individually members of it” (1 Corinthians 12: 27. The apostle Paul wrote to the super spiritual Corinthians, who were committing the sin of heresy and the heresy of sin, they were so spiritual what they did in the body did not matter, such as hooking up with prostitutes: 17 If anyone destroys God’s temple, God will destroy him. For God’s temple is holy, and you are that temple.” 1 Corinthians 3:17 No should be a temple, no would be a temple, no you got to be a temple, no you better be a better Christian so you are the Lord’s temple, not you should be the Church, it was the flat out indicative statement of God’s grace: you ARE THAT TEMPLE; you are the Body of Christ. For the first centuries of the Church, the Church, the Temple of the Lord’s Body, was being built all over the Roman empire and without actual church buildings. The Altar was there, as was the Baptismal font and the pulpit without the physical objects, for the physicality of the Church was there: This is my body, this is my blood, as you are the body of Christ, you are the Temple of the Holy Spirit. The Temple was built without human hands but for human hands to receive His Sacraments, hands lifted or fold in prayer, hands to help the neighbor in need. On a Sunday we don’t go to Church, we go as His Church to His Word and Sacraments, to the Divine Service. When Solomon built the Temple in Jerusalem, the King and the people of Israel brought into the Holy of Holies the Ark of the Covenant for within the Ark was the covenant, the 10 Commandments. The boundaries of the Temple are love of God and love of neighbor as detailed in the 10 commandments. The cleansing of the Temple is confession and absolution, the sacrament of repentance for what we have done and left undone in thought, word and deed. The word Lent means “spring”, Lent is the springtime of the Church and homes used to have spring cleaning. The Jews wanted to know by what sign Jesus was cleansing the temple. “But was there a need for a sign before putting a stop to their evil practices and freeing the house of God from such dishonor? Was not the fact that he had such great zeal for the house of God the greatest sign of his virtue?” When we go the doctor we are patients, but when it comes to trespass and evil, we must be impatients. Zeal for His Father’s House consumed Jesus, it ate Him up. It would consume Him. On another occasion the Lord was asked by what sign He was speaking and working, An evil and adulterous generation seeks for a sign, but no sign will be given to it except the sign of Jonah.” That is the sign of the Cross, as Jonah was in belly of the beast for 3 days and 3 nights for not preaching God’s Word, Jesus would die, descend into hell itself because He preached God’s Word, the Father’s House, the Temple. 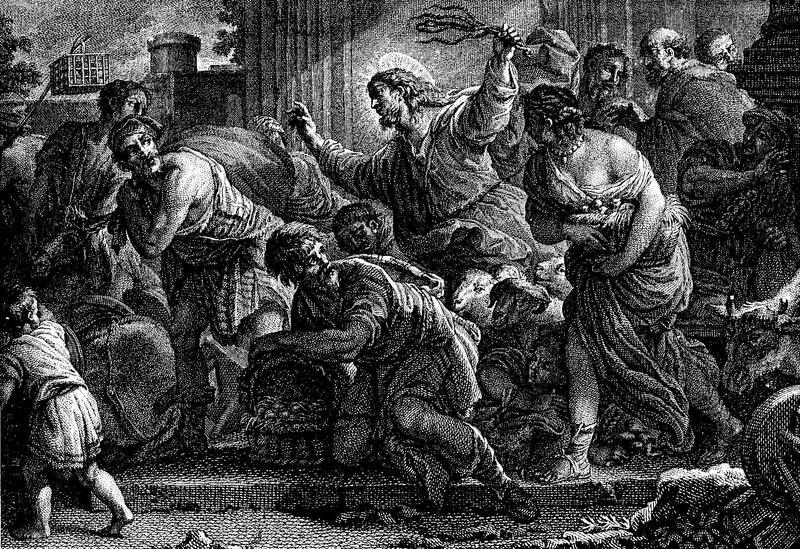 The Temple in Jerusalem was for the sacrifice of animals for the forgiveness of sins. Jesus cast out all the sacrificial animals, for behold, He is the lamb of God who takes away the sin of the world. His Temple is His sacrificed once and for all for the Temple for us. He is the Temple not made by human hands who cleanses the Temple. As for those Jews who believed in Him because of His signs, not for Himself, for what He was offering: Himself for the life of the world: His body, the fullness of the Godhead pleased to dwell in Christ Jesus. The Old Adam knows how to look out his own interests. Jesus knows what is in man. There are many in the Church who look after their own interests and not for the interests of Christ and the brothers and sisters. When Christians no longer love the Temple the Lord raised up from the dead, from our ashes and sin and sorrow, and the resurrection is grace, sheer gift, that is, the Lord Himself, then people are busy making new blueprints of the way they think His House should be: a mall, a bank, a club. Then the Lord’s House is reduced to a house of cards or a house of trade and that is plainly wrong.